The story of Random and Sarah who find themselves engulfed in a war against the Order, a dangerous organization wishing to take control of the world. 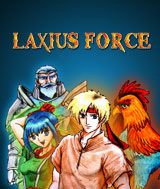 Laxius Force is an epic, addicting RPG at the crossroads of games like Baldur's Gate and the old Final Fantasy and Dragon Quest series. If any of those are among your favorite games, then you should definitely give Laxius Force a try.